ESAB Rebel EMP 215ic Review - Do NOT Buy Before Reading This! ESAB Rebel EMP 215ic Review – Do NOT Buy Before Reading This! Hello there! Welcome to the Esab Rebel Review. Today, I’m going to share an unbiased review about this welding machine with its latest features, pros and cons. Before introducing the Esab rebel welding machine to you, I would like to share something. You might know that “Unfortunately there is no single welding machine that is suitable for all welding process.” Here I found the remarkable magic of this Esab Rebel Emp 215ic. The first thing I do on a machine, I take a look at it to see how it is built. I like to evaluate the product through some questions. Let’s take a look at the questions lists to judge a machine before buying. Do I like it or do I not like it? Does it look like it is built cheap? What options come with it? What are the features with it? And most of all how does it perform? This is a multipurpose welding machine best seller in the category and works great whether you want Metal Inert Gas Welding (MIG), Flux corded welding or Stick welding. But, that’s not all. You can use this machine for Tungsten Inert Gas welding that is known as TIG. This welder is strong enough for any light industrial projects or can be the complete home-based solution. Even I used this machine on a shipyard for 8 months long, but it doesn’t give me a single chance to mastiffs. There is a lot more to tell you about this welder. Through this esab rebel emp 215ic review, I’ll evaluate every value I got by using this multi-process welding machine. And also, I’ll introduce a clear picture of this welding machine from front to back, inside to outside. The goal of owning a multipurpose welding machine is to give the owner some extra flexibility to use and their welding needs. Many brands promote this goal but they actually fail when the time comes to providing it. But, you can’t get a chance to think about this brand. 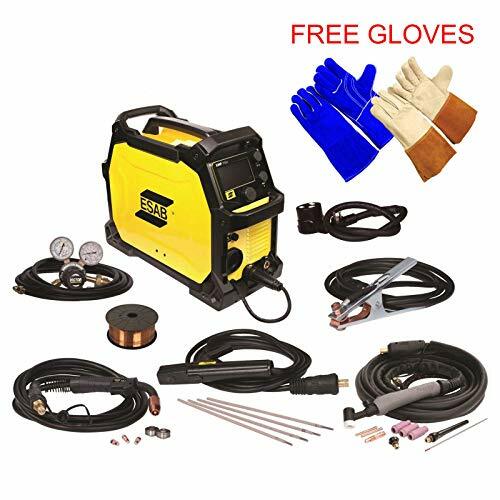 Earlier I mentioned that the Esab Rebel welding machine is a multipurpose welding machine for its outstanding performance for all the welding processes you need like MIG, Flux-corded, Stick and lift TIG.It is a complete package letting you take on mild steel, stainless or any aluminum. No matter where to happen to be. This is one of the most important features I would like to talk about in this Esab Rebel 215ic review part. The “sMIG”, that means it is a complete smart welding machine and can use Straight out of the box. This Esab rebel welding machine comes with 2 user modes. One is for beginner and another one is for an experienced person. The ability to adapt right job saves any beginner’s mistake such as running it too hot or cold. You’ll be able to start your fast welding or switch project faster with the sMIG feature. It is also a very good choice or those who are experienced person easy to figure out their own parameters. They can still use this machine’s smart MIG function as needed or modify the settings. For better arc stability, you’ll need to tweak the voltage, modify the wire speed and Rebel makes all that simple to do. Your setting for MIG will be determined by the type of metal you are welding, the thickness of the metal and the wire you are using. All you need to simply input these details to set your parameters with the Rebel’s sMIG function. Once you’ve entered your metal type and wire thickness, the Rebel makes it easy to start your welding for steel or Aluminum. The welding machine has an innovative and 4.3-inch large high-density display itself to provide a clear view of the current welding status. Not only this, you can read the user manual and the list of spare parts on the display that is available in multi-language. It’ll help to select your desired language if you interest in your own language or for someone who is not good at understanding English. I want to show some other things it comes with this is again this is a multi-process model so it comes with everything you’re going to need. It’s a multi-voltage machine so you have the pigtail adapter that comes with it. Get the gas hose and get a sample pack of 30 Esab wire of course you get your ground clamp and cable. A regulator, so you can adjust the gas flow and this actually kind of regulator I liked it has a little ball that floats in here because they’re a lot more accurate than the ones that have a separate meter, so that’s pretty neat right there. Besides these, you’ll get a sample pack of stick electrodes if you’re going to use it in stick mood. You’ll also get the stick electrode holder and if you’re going to use it in TIG mood, you’ll get a TIG torch which connects bodies nozzles and tungsten’s everything you’d pretty much need for your TIG welding application. As I said above, you can use this welding device straight out of the box, unlike some other multi–process welder. The machine comes with tweco fusion 180 MIG gun. So, no matter if you plan on doing more than the occasional hobby. Additional MIG gun parts kit with the contact tips. Also, comes with the related accessories and much more. As because it is a unique package to run your welding project successfully. So you don’t need to buy any additional equipment to start your first welding. These are the reasons below I love this welding machine. I love this machine mostly for its portability and convenient using experience. The machine lets you keep going without getting warm. All in one welding process including MIG, no need to buy any extra for TIG, Flux-corded and stick. The smart and bigger HD display to show your ongoing welding status. Available with adapter plugs with 230-volt and 120-volt. Smooth arc and additional attachment reduce extra costs. The machine runs great off of a heavy duty generator. It works best with Direct Current (DC), the whole machine is DC only. The plastic connector of the gun easily damaged during TIG. Cost is little higher than the other welding machine on the market. Industry Sector: This Esab Rebel welder machine is for the following industry. You can buy this welder if you are involved with Light fabrication, Repair and maintenance, automotive bodies, for mechanical construction, for civil construction, HVAC, for agricultural equipment and for the training school. The Primary volt of this m/c – 120-220 V and the Supply volt range is 120-220 V.
Maximum output is- 240 Amp. MIG welding output: (230V) 25% duty cycle, 205 A/24.3-V and (120V) 20% duty cycle, 130 A/20.5-V.
TIG welding output: (230V) 30% duty cycle, 180 A/17.2-V and (120V) 40% duty cycle, 130 A/15.2-V.
Wire diameter range: Mild Steel 0.6-1.0mm, Stainless Steel 0.8-1.0mm, Aluminum 0.8-1.2mm, Flux Cored 0.8-1.2mm. Wire spool size- 100mm, 200mm. Item weight: 55 lbs (almost 25 kgs). Other Speciality: If you take a look at the machine, the first thing you’ll notice is a procedure chart going to give you amperages and voltages for your various metal sizes, various wire thicknesses, different gases that you might use for different processes. That’s pretty handy and you’ll come to see this particular model even this is almost unnecessary because the technology that goes into this machine allows you to do all the stuff automatically right from the front. This has a smart MIG feature where you just set your thickness of your material and it takes care of amperages and voltages you don’t need to worry about it. You can put a 12.5-pound spool wire into the machine. It has handle in front and back, so two persons can easily carry this machine. It also has a handle on top of the machine to carry by a single person also. Through this unbiased ESAB Rebel EMP 215ic review, I tried to highlight every possible value that you can get from this welding machine. If you are looking all-in-one machine, the Esab Rebel 215ic gets the job done for you. It offers dual frequency support, convenient design, Handy and portability and consistent welding. If you are up for the investment or want to finish a hassle-free welding project, you must buy this welder.